Fully customize your 2 or 3 tier Titan Mass Storage System with this rotating shelf add-on to store your medicine balls, dumbbells, and kettlebells! - 70" of usable space allows you to store an ample amount for dumbbells, ketllebells, or medicine balls. - This rotating shelf installs onto your preexisting Titan 2-Tier and 3-Tier Mass Storage System. 70" of usable space allows you to store an ample amount for dumbbells, ketllebells, or medicine balls. Can be mounted along 5 different angle settings. 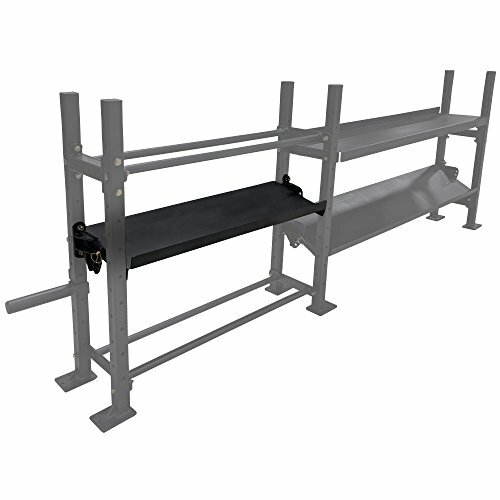 This rotating shelf installs onto your preexisting Titan 2-Tier and 3-Tier Mass Storage System.